Well, the boat is starting to look much more like a boat now! All the bridgeck floor is done, as well as deck lockers up in the bows. 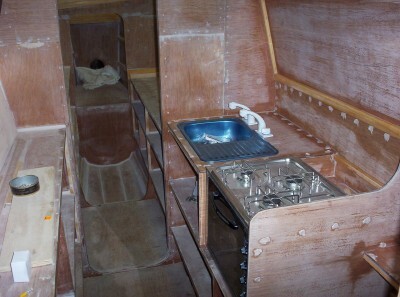 The galley is laid out, with the stove and sink. One tap will be sea water and the other fresh water. I've been buying the chandlery items as I build to make sure everything fits. 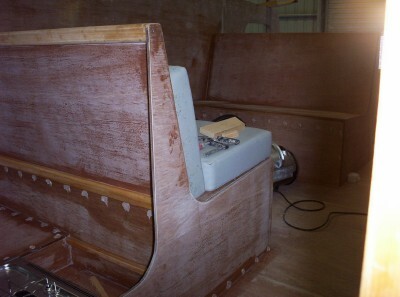 The two seats in the saloon are built. I haven't started on the table yet. It all converts into an extra (almost) double berth if needed. The seat tops are reversible, being horizontal for sleeping, and slightly sloped for seating comfort. I've nearly finished the starboard transom. It's a bit more involved than the portside. There's a recess for a 3 step telescopic ladder, and there's also a locker built under the middle step. That's where the deck shower hose will be stowed, and there's also plenty of room for goggles and flippers. The Yamaha outboard is an earlier hi-thrust model that was given to me by a club member. I don't know yet if its any good, but at least I've been able to put it in the outboard well and make sure there's enough clearance everywhere. 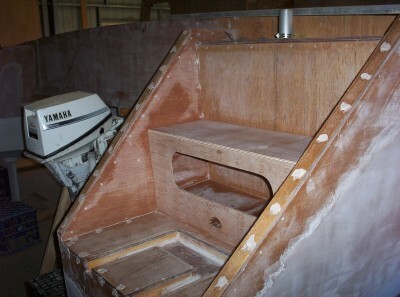 I've just started on the cabin sides, and also on the cockpit seats, which cover the outboards & fuel lockers.